There's plenty to do in this small town on the Gulf of Mexico, like boating, wildlife watching and eating at unpretentious restaurants. Yet the area is still, for the most part, refreshingly free of overdevelopment. The beaches have gently lapping waves that won't topple little ones, with sand that's the color and texture of granulated sugar. 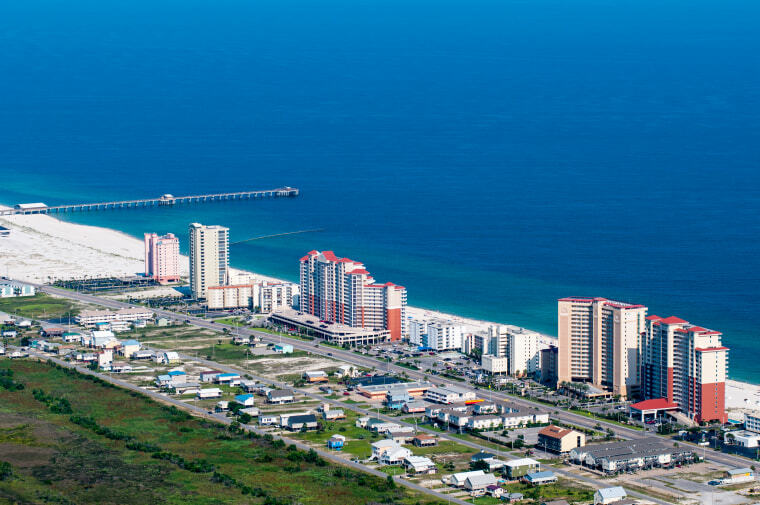 For kids age 5 and up, a 90-minute tour with Orange Beach Cat Boat Tours is perhaps the quintessential Gulf Shores experience. For the uninitiated, a cat boat is a small, motorized runabout that seats two and is surprisingly easy to maneuver. With a guide in the lead and your little one by your side, you can pilot your own boat in search of dolphins, herons, osprey and more. Rather see the dolphins from a stand-up paddleboard? Take a 40-minute ferry ride from Mobile Point to quiet, pristine Dauphin Island, and Dauphin Island SUP will deliver a board to you. Afterwards, you can visit the 19th-century Fort Gaines, where costumed guides in Civil War dress demonstrate blacksmithing and cannon firing. Guests at the Bon Secour Wildlife Refuge, a sprawling coastal preserve of dunes and woodlands, are encouraged to hike quietly and look carefully, all the better to spot wildlife like Loggerhead sea turtles and the endangered Alabama beach mouse. The World War II battleship USS Alabama in Mobile is a worthy stop on your way to or from the coast. Kids can get their stuck-in-the-car wiggles out and learn a few things amid the historical planes, tanks, helicopters and artillery. Adjacent to the ship is the USS Drum, the oldest American submarine on public display. The Beach Club is a collection of condominiums spread across four separate buildings, each with their own pool. There are also cottages arranged around the property's three lakes, many with private pools and hot tubs. On the main lawn, guests gather for food trucks, activities like laser tag and face painting and a weekly barbecue and shrimp boil. Kiva Dunes Resort offers a choice between both condominiums and stand-alone homes with playful names like Key Lime Pie and Yellow Submarine. There are four pools, including a saltwater one that sits high on a dune overlooking the mile-long private beach. The beachfront Lulu's Gulf Shores is the brainchild of Lucy Buffett, sister of Jimmy Buffet, and you'd better believe that the cheeseburgers — and other tasty choices like shrimp baskets, gumbo and fried green tomatoes — are delicious. The waits can be long and reservations aren't accepted, but there's a form on the restaurant's web site that lets you reserve a spot in the queue. While they wait, your kids can climb the ropes course, hang out in the arcade (there's a bar serving smoothies and cocktails), walk on water inside an inflatable sphere or get a henna tattoo.